made of silver in center. where many Toris (throw away, take off) are. Edo was the largest city in the world at that time with population of one million. The half of those were samurai families. And there gathered many envoy samurais from local hans, craftsmen and merchants, so it was a completely men's society. In other word, it's also a seller's market for women in terms of marriage. 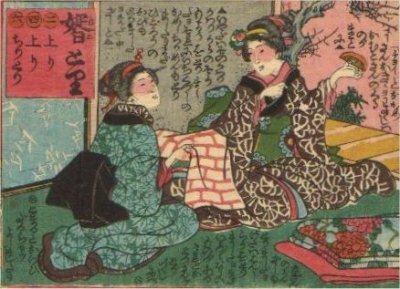 The matchmaker expected to receive "Bu-ichi", one tenth of its betrothal, thus there were many professional matchmakers who looked for marriageable girls and boys to set up the marriage.